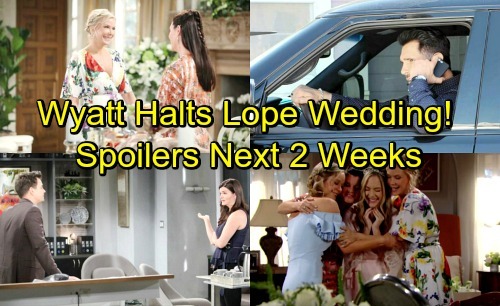 The Bold and the Beautiful (B&B) spoilers for the next two weeks tease that more manipulation is on the way. The week of May 21-25 will bring another dirty trick from Bill (Don Diamont). He’ll offer bogus proof of his future with Steffy (Jacqueline MacInnes Wood) and anger Liam (Scott Clifton) in the process. After Bill holds up the painting he took from Steffy’s place, he’ll suggest that she doesn’t mind when he drops by. Bill will assure Liam that everything’s working out for all of them. The Bold and the Beautiful spoilers say Liam will once again fall for Bill’s deception. He’ll rip into his father and take comfort in the fact that he has Hope (Annika Noelle). Meanwhile, Katie (Heather Tom) will struggle to keep Wyatt’s (Darin Brooks) mouth shut. They’ll both wrestle with guilt, but Wyatt’s will be stronger. He’s the one responsible for deceiving his own brother. Wyatt will hate lying to Liam, but Katie will maintain that it’s for the best. She’ll hope Wyatt can stay quiet and let this “Lope” marriage happen. After an OB-GYN appointment and a shouting match with Liam, Steffy should be feeling pretty low. Ridge (Thorsten Kaye) will keep fighting for his daughter’s happiness, but Brooke (Katherine Kelly Lang) will do the same. In the end, only Liam’s vote matters here. He’ll stick with his choice and prepare to tie the knot. Carter (Lawrence Saint-Victor) will kick things off as Hope and Liam bask in that wedding glow. He’ll be happy to officiate for this blissful couple. However, Wyatt’s about to deliver a shocker. During the week of May 28-June 1, Wyatt will halt the nuptials and insist on speaking with Liam alone. Naturally, Liam will wonder if it can wait. He’ll obviously be pretty busy in that moment! Wyatt will contend that this conversation needs to happen right now. B&B spoilers say Liam will step out with Wyatt and demand to know what this is all about. Will Wyatt come clean about Bill’s evil plot? He might as well since he’s turning this wedding into a total disaster. Poor Hope won’t have a clue what’s going on. The same goes for all the guests. Of course, that won’t stop everyone from speculating! The Bold and the Beautiful spoilers state that some great drama’s coming up. We’ll give you updates as other B&B news emerges. Stick with the CBS soap and don’t forget to check CDL often for the latest Bold and the Beautiful spoilers, updates, and news.